Inglorious Basterds. Now I know some of you may gasp at the fact that I'm suggesting you watch a foul-tongued, gore-filled Quentin Tarantino movie. I personally happen to like Tarantino's style of directing- this one was a little bit different for me than all of the rest. This is Christoph Waltz. 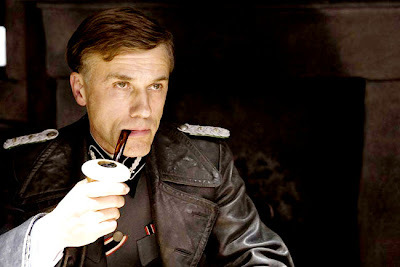 He is an Austrian actor that was cast to play the sinister Col. Hans Landa aka "The Jew Hunter." His portrayal of this character was phenomenal. He manages to be creepy, evil, somewhat likeable and even funny all at once. He's been nominated for a Golden Globe and I sure as all heck hope he wins because he does an amazing job! So for those of you who haven't seen this movie, its about Nazi-occupied France. It revolves around a few characters. Shosanna (Melanie Laurent)- a French Jew whose family is killed by Landa. Shosanna escapes death and is living in disguise in France. She is posing as a cinema owner who catches the eye of a Nazi war hero Pvt. Frederick Zoller (Daniel Bruhl). He becomes slightly infatuated with her and somehow is able to convince the higher-ranking Nazi officials to have an illustrious movie premier (his own movie) at her cinema. Knowing that tons of high ranking Nazi officials, including Hitler himself, will be at this premier Shosanna begins to plot her revenge to destroy the Nazis. Lt. Aldo Raine (Brad Pitt)- the leader of a group of American Jews called "The Basterds" have been implanted in France. Here's one of my most favorite movie quotes from him to explain exactly what they're supposed to be doing: "You probably heard we ain't in the prisoner-takin' business; we in the killin' Nazi business. And cousin, Business is a-boomin'." So basically, Raine and eight others are in France killing Nazi's and leaving a trail of fear. They rarely let people live and if they do, they carve swastikas into their foreheads. Raine and his men get wind from a German movie star (Diane Kruger) that all four of the German leaders are going to this movie premier. The Basterds then plan a suicide mission to kill 'em all. I'm not going to give away the ending, you'll just have to watch it to see how this whole thing pans out. Oh and the character Brad Pitt plays is probably one of his best roles in a long time! we say this at the cinema here... and loved it... it was a very well put together movie, with lots of character!